Sing me a song won’t you? I am always humming a tune. 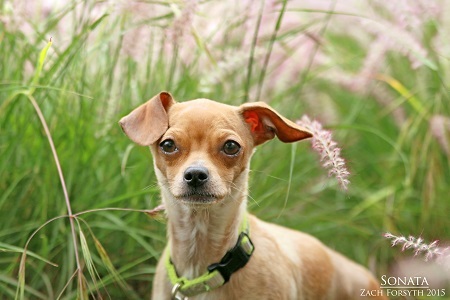 My name’s Sonata and I am a 4 year old Chihuahua mix with a heart of gold. I am soft spoken and sensitive, but once we have shared some treats together we will be best friends! I am a loyal lover who enjoys lap time, nap time, and run-around-with-a-squeaky-toy time! I did come to Pixie Project with two tiny puppies who are all grown up and in their new homes now. I was a great mommy, but now I’m ready for someone to take care of me! As long as I am introduced positively I will get along with anyone, and while I may never be a dog park dog I’m sure to love another sweet dog in your home. Do I sound like the gentle soul you have been searching for? Fill out an adoption application so we can schedule a meet and greet. I am fixed, vaccinated and microchipped. My adoption fee is $250.